I started ballet Fall 2014. No, I [and my two sisters] was so involved with sports that there was no extra time to take dance. We did gymnastics so we received a lil dance training for floor exercise, but other than that all dancing in our home was self taught. I’ve always wanted to take ballet and a friend of mine, who grew up dancing, mentioned she still attends dance class as an adult. That got me thinking, “Hey, I bet I can find a beginners class somewhere”. I also found this blog and it made me realize I wasn’t the only person interested in adult ballet. The clothes. Haha, just kidding. I mean, I love my tights, leotard and skirt, but there is so much that I enjoy about ballet. I love the beautiful lines in a simple plie or in a jete, ballet is just so clean and precise. However, my favorite part of ballet is mastering a new move and knowing you’ve nailed a combination that’s previously given you trouble. The flexibility and foot control. I have bad ankles from years of soccer and it makes releves hard to master. My balance normally is pretty stellar, but on releve I’m extremely wobbly. I am also incredibly INFLEXIBLE so my movements aren’t nearly as beautiful as I’d like them. Oh and my tight hips, yeah they don’t really help either. This blog was a big inspiration. 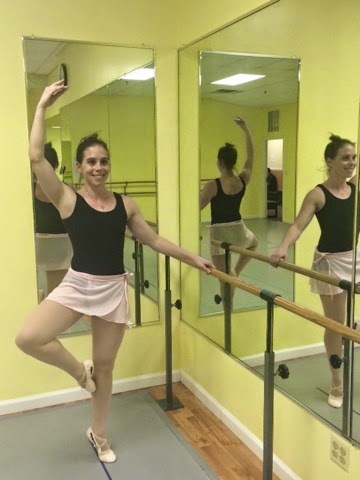 Adult ballet was on my mind for awhile and when I stumbled across this blog it was like the go ahead I needed to try a class. The Nutcracker and Swan Lake are my other inspirations. I’ll never get tired of watching either ballet. The desire to get better and the high of nailing a new combination or receiving praise from my teacher. Sometimes I’m dragging at the beginning of class and my plies are just blah. But, by the end when we’re going across the floor I find myself wishing for a longer class because I’m having so much fun. I enjoy the challenge of something new every class. No, unless you count the occasional Zumba class. I took beginners modern, jazz and ballroom dancing in college and those were some of my favorite courses. I still play coed soccer, am on multiple kickball teams, run, play tennis, workout at the gym and sporadically attend yoga classes. [Squats don’t really come in handy when I’m trying to plie, my teacher calls me out all the time for an untucked tush]. I also love to read, blog and cook in my spare time. Take the plunge and just do it. Even if you’re scared you’ll look silly, in a beginners class everyone is new. Remember to take each class at a time and that Rome wasn’t built in a day. You’ll have good classes and challenging class but don’t give up. I’m just really happy I took the plunge and attended a class. It is such a fun activity and I love ‘playing ballerina’ once a week. I’m not very good and I have so much to work on, but I truly enjoy the challenge. Dancers from Gabrielle Menezes on Vimeo. Gabrielle Menezes created a short film, Dancers, because she had recently started taking classes herself and was fascinated by the other dancers in her class. Learn more about her and the film below! What is your background in film and media? I was a TV journalist for many years, and the West Africa reporter for Al Jazeera. I was based in Abidjan and covered conflicts, and really felt burnt out over four years. I really wanted to do documentary films that were more creative and poetic so I started making films like these in-between freelancing for the United Nations. My current work is broad, but includes films that can really make a difference to people’s lives. I’ve made training videos to teach NGO’s how to deal with child trafficking or films that teach nomadic pastoralists how to grow drought resistant crops. My other work is creative documentary, that walks along the border of fact and fiction. I’ve always felt that if we are made of memory as well as imagination, a news documentary can’t capture the full human experience. What made you want to make a film about adult ballet dancers? I recently started beginner ballet classes, and during the class became fascinated by the other dancers. They ranged from older ladies, to girls in their perfect pink tights and satin ribbons on their shoes, and even included the unexpected, shy man. I thought that the dancers in the class were beautiful even without being perfect or close to that. I found myself thinking about a lecture that the script writer Charlie Kauffman gave where he says: “I’ve never delivered a speech before, which is why I decided to do this tonight. I wanted to do something that I don’t know how to do, and offer you the experience of watching someone fumble. Because I think maybe that’s what art should offer, an opportunity to recognize our common humanity and vulnerability.” I wanted to capture something of this experience on film. What school did you choose to film, and why? It was harder than I thought to find a class where people were OK with being filmed. I had started taking classes at Danceworks in London, and so asked a couple of ballet teachers there if they were willing to participate. Franziska welcomed the opportunity. She was so patient with making the students feel comfortable with the idea of filming, and without her help the film really wouldn’t have taken place. What made you decide to go to ballet classes the film or something else? I’ve always loved dance and as a young girl did ballet, and ballroom, but then gave it up as a teenager. After going to a ballet performance at the Royal Opera House of Raven Girl which was choreographed by Wayne McGregor, I was inspired to dance. I wanted to dance ballet. I had given up ballet at 13, because I felt that I wasn’t good enough, that I was not graceful or perfect. But now the desire to dance was stronger in me than the desire to be perfect. Besides, my eight year old self squealed with delight when I bought ballet shoes. What advice would you give to those just starting or looking to start ballet? To be patient with yourself, and not to expect to dance ‘Swan Lake’ after the first class. I always remind myself that I’m not a professional ballet dancer, and have no reason to look like one. What is most important is to enjoy ballet and the feeling of grace that it gives you.